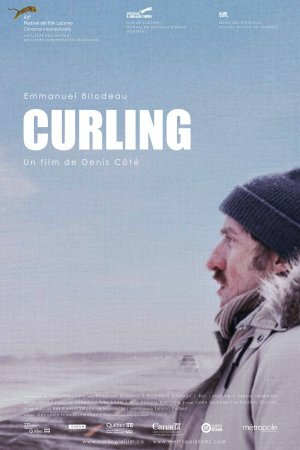 Haunting and enigmatic, Denis Côté’s 2010 French-language, Canadian-shot CURLING is a deceptively simple domestic drama that cuts a narrow, loping trail through a dark, impenetrable forest of mystery. I’m almost hesitant to use the word mystery – not because it doesn’t fit the tone of the film, but because, when applied to fiction, there’s the tacit implication of an eventual solution – some ultimate revelation that assembles the shadows, that throws light on the secret order hiding inside of the black. CURLING offers no such satisfaction, but instead begs the viewer to draw their own conclusions about the banal domestic crises of a lonely Canadian family and the stoic, blood-soaked wilderness over which their story unfolds. Set in the snowy wilds of Quebec, CURLING tells the story of Jean-Francois Sauvageau (Emmanuel Bilodeau), a hollow-eyed janitor who lives alone with his 12-year-old daughter, Julyvonne (played by Bilodeau’s real-life child, Philomène). Solitary and rabidly loyal to the family’s right to privacy, Jean-Francois has kept Julyvonne out of school. As he wanders between his jobs at a run-down bowling alley and a dilapidated trucker motel, Julyvonne is left at home, his strict household rules her only companions. Jean’s coworkers become increasingly skeptical about his lifestyle and parenting choices, and he spirals deeper and deeper into depression. Realized mainly in fixed medium shot, Côté, who took home the best director prize following the film’s screening at the Locarno International Film Festival in 2010, uses the sweeping desolation of rural Canada as a mirror for Jean-Francois’ emptying heart. As father and daughter independently wander the snowy expanses of their bucolic town, they each encounter cryptic and alarming mysteries – a blood-soaked motel room, frozen corpses, a wounded child bleeding on the side of the road. Police cars crisscross the frozen roads and, at one point, a ferocious, exotic animal is seen stalking the North American tundra. It all hints at some vast, indefinable darkness looming over the village, but, unlike in BLUE VELVET, where the discovery of a single, dismembered ear leads the protagonist spiraling into the bowels of his small town’s depravity, the incidents go largely unremarked upon. As happens too often in real life, the questions they pose remain unanswered. Browse various reviews of the film, and you’ll notice that the adjective “nihilistic” is frequently invoked. It’s easy to see why (For starters, Côté’s production company is called Nihilproductions). Jean-Francois inherently questions society’s ability to civilize a person – he almost seems to view civilization itself as a cunning guise of order constructed as a playpen for human misbehavior, as if mankind has collectively agreed that rules are actually, literally created to be broken. He struggles desperately against the town’s will to socialize his daughter, choosing instead to attempt his own isolated, undisturbed and highly structured existence, while raising Julyvonne to do the same. It’s the conflict between this compulsive hunger for an ordered life and the resulting deep loneliness and existential confusion that drive the movie toward an appropriately unsatisfying conclusion.